Mortgage life insurance pays the mortgage if you die. 3. How Many Names Can Be on a Mortgage? When you buy a home and take out a mortgage, you can purchase mortgage life insurance to pay the outstanding loan amount. In the case of married couples, either partner may buy such insurance if their name is on the mortgage contract. Both names are not required. But don't confuse mortgage life insurance with private mortgage insurance. With a mortgage life insurance policy, if an insured person responsible to pay the mortgage dies, the insurance pays the balance either in monthly payments or as a lump sum depending on the policy; the mortgage holder is the beneficiary. For example, if a married couple buys a house but only put the husband's name on the contract, they may purchase a mortgage life insurance policy for the husband. If he dies, she gets no money but the mortgage gets paid off. Although both names of a married couple need not appear on the contract for mortgage life insurance purposes, other laws or rules may. Marriage laws vary from state to state, and your state may require both partners to put their names on a mortgage contract. Lenders may require both names to qualify for a loan, especially if both partners have income and need each other to make the payments. Such requirements appear clearly during a loan application process. Once the contract is made, you can purchase mortgage life insurance for anyone whose name is on it. Many people confuse private mortgage insurance, which may be required, with mortgage life insurance, which is optional. Generally speaking, if your loan exceeds 80 percent of the purchase price of the house, the lender requires you to buy private mortgage insurance for the contract, regardless of whose name appears on it. If the person named on the contract dies, the insurance pays off the loan. After the loan amount is paid down to less than 80 percent of the purchase price, PMI is no longer required. 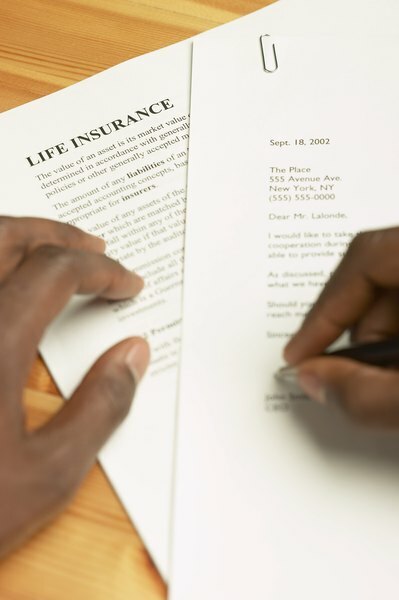 The total amount and type of life insurance you need is a very personal decision based on how much money you have, how much your family will need if you die and how much you would like them to have. These three factors help determine the amount you're willing to pay for life insurance premiums. If your mortgage lender insists on private mortgage insurance, money spent for an additional mortgage life insurance policy is wasted, because it would only pay toward the mortgage and not assist your survivors in any additional estate costs after your death. Can I Deduct PMI Mortgage Insurance on My Taxes?